Hmm, why’s that then? Female logic, eh? For a fleeting, hopeful second I thought she might be a proponent. Although the number of women found guilty declined slightly – last year 107,000 were given a criminal record for failing to pay money to the BBC – as a proportion of the total number prosecuted, it was up by almost one percentage point, from 2015’s 70.8 per cent to 71.9 per cent. If any other law or tax affected women to the same extent the feminist warriors at the BBC and Guardian would all be at the barricades complaining about sexism and discrimination and demanding that the evil Tory tax be axed. Given the limited data it seems that only 17,700 men (or other “not-women”) were found guilty so the relevant statistic would be that women were 85% of those found guilty. If there was a man in the household, it is more likely that he would be charged since he doesn’t have the let-out clause “my wife made me do it” so one assumes that all (or virtually all) of the 101,000 women convicted were in households without adult males and below the age of 75. Not quite BIND, the “TVL178 – Record of Interview Form” is the primary evidence used by TV licensing to obtain a prosecution. This is the form that TV License Goons fill in when they visit a property and force themselves on the unsuspecting homeowner. Since they are primarily on the prowl during the day it is not the man of the house they are left talking to (who would probably have sent them away with at least a flea in his ear, if not a baseball bat), but a part-time or stay-at-home mum who is easily intimidated. I’m sure single female households make up some proportion of that number of women prosecuted, but I bet most of it will be mums at home during the day. The thing about the TVL178 is that it is signed by whomever answers the door, not the owner or renter of the house, not the council tax payer, just whoever opens the door. 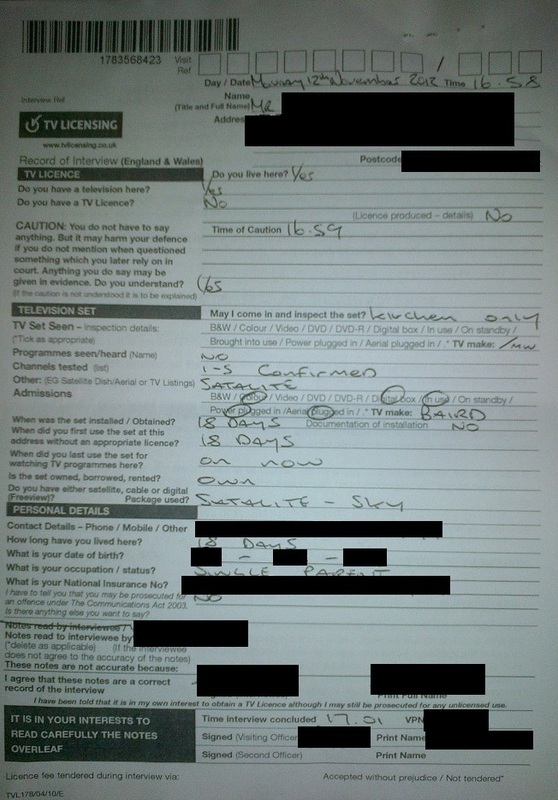 There have been examples where the TVL178 form has been signed by a non-resident (not aware of what they were committing the owner/renter of the property to), but TV Licensing doesn’t want you to know about it’s multitudinous failures so those cases (in fact almost all cases where the occupant turns up and wants to actively defend the case and challenge the TV licensing view of events are dropped on the day of the hearing. Bad PR for Auntie Beeb you see. Thanks for the explanation, but my main point still stands. In any other sphere of life if women were seen to be so discriminated against, no matter what the reason, the usual suspects at the Guardian and BBC would be mounting their outrage chariots.